Amun-Re, a form of the sun god, is sometimes depicted as a sphinx or a human with the head of a hawk. The disk of the sun is a symbol of this god. The word Amun means "the hidden" or the "hiddenness of divinity", whereas Re means "the sun" or the "divinity in the power of the sun". The god Amun-Re is a representation of these two ideas: the ever-present invisible power and radiant light of the divine force that sustains life. To trace the origin of Amun-Re, we must go back to the Old Kingdom and Heliopolis, where the god Re first appeared as the primary manifestation of the sun god. Re is depicted with the head of a falcon surmounted by the sun disk during his passage across the sky, and with the head of a ram during his nocturnal voyage in the underworld. This local god rose in prominence to become a national god, resulting in the erection of sun temples throughout the land. 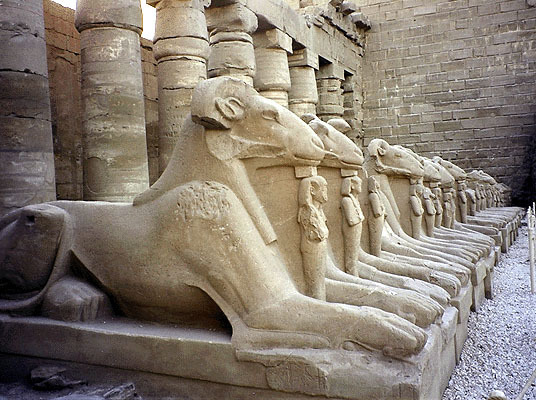 In the fourth dynasty, the pharaohs began to consider themselves manifestations of this god. Later, during the Middle Kingdom, when Amun became the most important god, Re was fused with him to become Amun-Re. Re is sometimes spelled Ra; and Amun-Re is sometimes written as Amen-Ra or Amun-Ra.